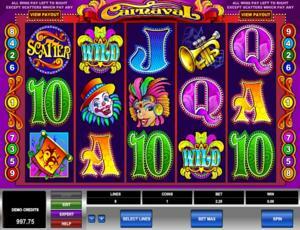 Carnaval is a vibrantly colorful and cheerful online video slot machine game released in November 1999. It is offered exclusively at online casinos powered by Microgaming. This video slot game has 5 reels and 9 pay lines. The theme of Carnaval is based upon the most famous Brazilian holiday known as Carnaval or Mardi Gras. Dance to the beat of samba music while you reap cool prizes at the Carnaval online slot game! Did you know that since Carnaval is the most famous holiday in Brazil, 70% of tourists visit the country just to witness it? If you want to visit Brazil for its most joyful event, you will surely love going to Rio de Janeiro, where Carnaval is celebrated via huge parades that are held in large sambadromes. You will encounter all of these and more when you play the Carnaval online slot game, and you don’t even have to leave your desk! Microgaming online slot games are available to players in 2 formats – download and no-download. Whether you like to download their software first or you prefer to play instantly without the need to download, then Microgaming surely has online slot machine games to accommodate your every slot gaming preference. Good thing that Carnaval is available for instant play, so you do not have to download anything to find out if this game interests you in a way that you would like to spend some real money on it. Carnaval is created for those who love celebrating Mardi Gras and having a fun time dancing to the beat of samba music while enjoying a round of spins in this slot game. Carnaval is the best choice to try out slots if it’s your first time, or if you are someone who would like to have a round of slots action without too much fancy stuff going on. The Carnaval online video slot game features scatter wins, a wild symbol, a maximum coin jackpot of 5,000, and last but not least, it has a 96.94% payout ratio! The quality of the graphics and sound that Microgaming provides is totally fantastic and top notch. They have an impeccable reputation of making the most spectacular graphics and true-to-life sound effects that will truly transport you to “that specific theme” they used in any of their slot games. Most people love to play games incorporated with Microgaming software because they have smooth animation and engaging yet non-interfering sounds. In Carnaval, players are brought to the wonderful city of Rio de Janeiro in Brazil, where people are celebrating Carnaval, the most famous holiday in Brazil which is held annually. The symbols are drawn in a cartoonish fashion, and even if they are vibrantly colored, you will certainly play here for a long time because it will not hurt or strain your eyes. Simple animated programming is used on the symbols when you successfully hit winning combinations. The overall graphic design of Carnaval displays the vibrant colors that you will see at the Carnaval parade, especially the color purple. Other colors used are blue, green, red, orange, pink, black and white. Samba is the constant background music you will hear while playing this game, along with some faint sounds of people chattering as they enjoy the festivities. When you spin the reels, drumming sounds will be heard. When you get winning combinations, different celebratory sounds, sometimes accompanied by either whistles or maracas/cymbals will be played out. The card deck symbols available in the Carnaval online video slot game are 10, J, Q, K, and Ace, and they are designed with neon lights to match the game’s theme. The regular symbols that you will find in Carnaval are the Carnaval logo, the Show Girl, the Clown, the Banner, and the Trumpet. The Wild Symbol is the Carnaval Headdress symbol. It acts as a substitute for all other symbols (except for the scatter symbol) in order to help you complete a winning combination. The Carnaval Headdress wild symbols only come out on the 2nd, 3rd and 4th reels. The Scatter Symbol is the Scatter. The scatter symbol is not required to appear in a line (on an enabled pay line) for you to win. The Scatter symbol can be found scattered anywhere on the 5 reels, and you are able to form winning combinations as long as there are 3 or more Scatter symbols that appear. Your winnings are calculated by multiplying the Scatter symbol combination payout (refer to the Payout table) by the total number of coins you’ve bet. Please take note that if you get a scatter win and a regular win, then you are paid out for both of these wins, because the Scatter symbol is not required to come out on an enabled pay line for you to win. Scatter awards are independent from pay line awards, and thus they are added to the pay line win. The Carnaval online slot game does not have any Bonus Feature games. Carnaval has 5 reels where you may bet on 9 pay lines. The minimum bet is 0.01 and the maximum bet is 10.00 per pay line. You can wager 1 coin only per pay line bet. Therefore, the maximum bet amount is 90.00 per spin. Please take note that the amounts mentioned are in Pounds, but they will remain the same if you choose to play in US dollars, Euros, or Canadian dollars. Also, for every coin that you wager, you will enable another pay line. You will be paid out for winning combinations on enabled pay lines only. The maximum payout in the standard Carnaval online video slot game is 5,000 credits per line bet. People who often play online casino games obviously love to stay longer on online slot games that have an Autoplay function. Good thing that Carnaval comes with this nifty function! In Microgaming online slot games, they have 2 game modes – Regular mode and Expert mode. You can have the game spin automatically for you with the Autoplay function that can be found by clicking the Expert button (located at the lower left portion of the game screen). After customizing the Autoplay function to your preferences, just click on the Start button, and the game will automatically spin for you while you just sit back, relax, and enjoy playing this colorful, lively and fun-filled online video slot game!